od 20 min. do 50 godz. Fall Blau uses a modified version of the classic Operation Typhoon/Victory in the West system which uses a randomly drawn strength chit pull for strong units to determine their combat value. The basic turn sequence is classic IGO-UGO which consists of movement and combat, with possible attacks for mechanized units during movement. Planes are simplified through the use of Air Points. 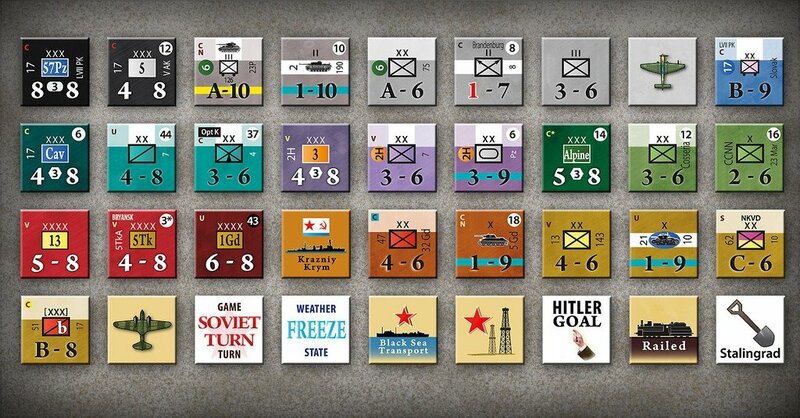 As the campaign progresses, the Axis player is constantly hampered with supply limitations. The supply/support system is tied closely with combat and restricts the Axis player from being able to attack everywhere at once. Each turn covers 3 days. Each scenario literally breaks battles off into smaller pieces for shorter playtime and smaller space requirements. Scale is just over 10km (6.5 miles) per hex and basic units are divisions, with Soviet corps, brigades, and tank battalions, as needed. The Order of Battle came from various sources, largely from the works of David Glantz, and further fine-tuned to give a reasonably accurate flow to the campaign. Three full-sized maps with two smaller extensions run from Kursk toward Baku across the diagonal. Fall Blau boasts a very accurate portrayal of the rail network at the time of these battles. There are nine scenarios in the game: six small and three major campaigns. Five of the smaller scenarios are designed to form a balance arc. The first “learning” scenario is a pro-Axis solo exercise so players can get familiar with aspects of the game in a small setting. Balance then shifts toward the Soviet side as players progress through the list of scenarios. Operation Uranus is the inverse of the first scenario with the Soviets busting up the opposition. The last (‘Gates’) scenario is a large snippet of the campaign and was added to capture a high point in the campaign. 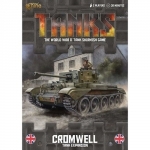 For the main campaign there are a few German panzer divisions and SS-LAH division available as options. The Eleventh Armee can be kept from going to Leningrad and sent to help capture the oilfields as an option. Free and historical setup options are available and automatic victory goals based on Hitler’s whim. So there is plenty of replay value built into the game. Here’s a brief summary of what you can play. Drive to Voronezh (Four Turns/Avg Time 90 min)- First German drive from 28 June to 9 July 1942. Clearing the Don Bend (Four Turns/Avg Time 90 min)- Covers the pocket and counterattack of the 1st Tank Army before Kalach from 22 July to 2 August 1942. 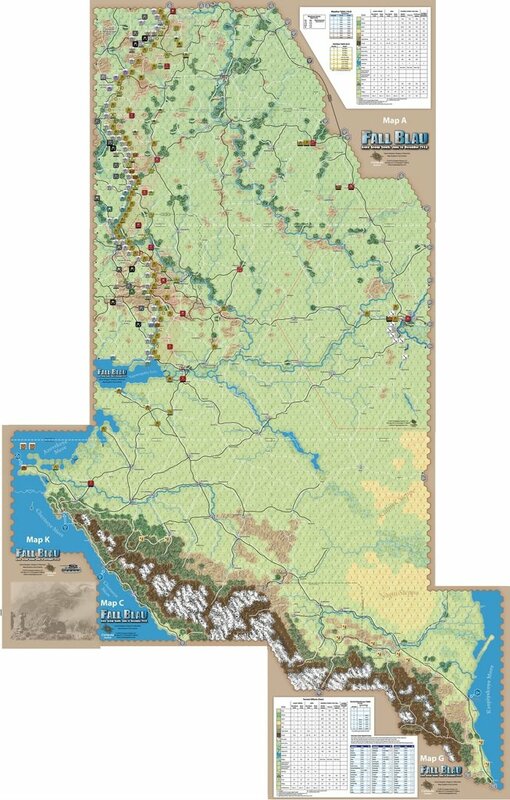 The Nal'chik-Ordzhonikidze Operation (Six Turns/Avg Time 90 min)- Covers the attempt by the III PzKorps to take Ordzhonikidze from 25 October to 9 November 1942. Operation Uranus (Three Turns/Avg Time 100 min)- The encirclement of Stalingrad from 19 to 27 November 1942. To the Gates of Stalingrad (Eighteen Turns/Avg Time 8 hrs)- Covers the final thrust to capture Stalingrad which led to the long bloody fight for the city, 3 August to 25 September 1942. 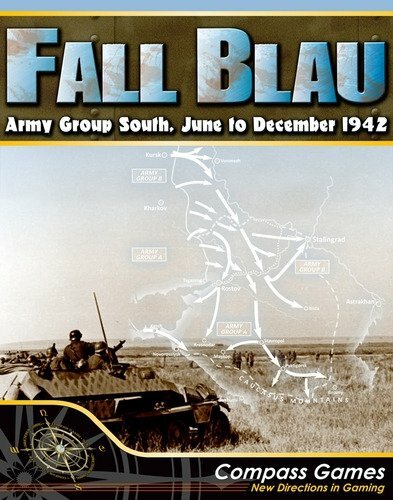 Fall Blau (60 Turns/Avg Time 40-50 hrs)- All Maps - Starting at 28 June 1942 and ending on 25 December 1942. Historical July Campaign (10 Turns/Avg Time 8-10 hrs)- Maps A & B - Covers the initial Operation Blue, 28 June up to 27 July 1942 with all historical options applied. Caucasus Campaign (36 Turns/Avg Time 12 hrs)- Maps B, C, K, & G (roughly 4'x4') - Covers the drive into the Caucasus aimed at the oilfields of Maikop and Groznyy, 25 July to 9 November 1942.